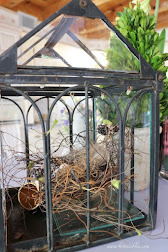 In early March I began renovating our half bath to give it a new French style. 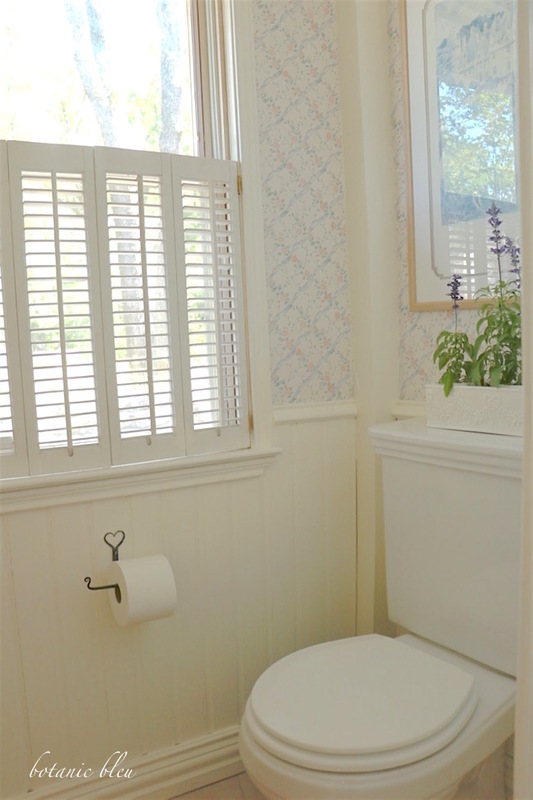 Little by little I have been updating each room in the house from an American Country style to a French Country style, and the guest half bath is the latest room for French-inspired updates. 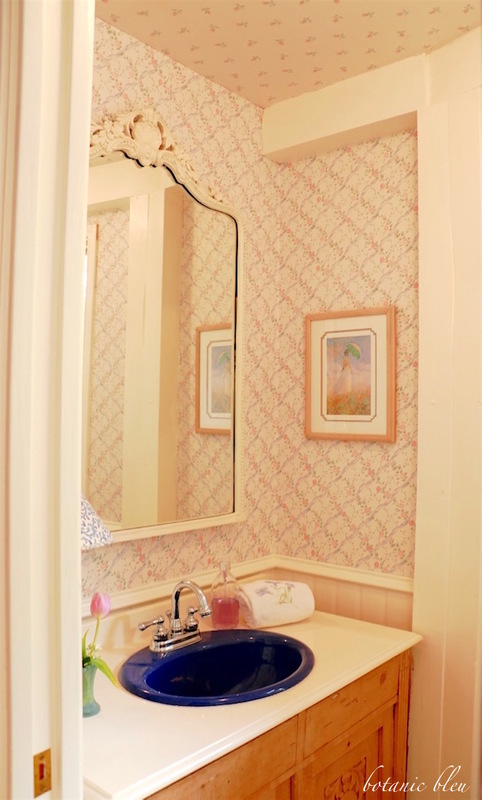 Exchanging a vintage hand-carved pine mirror for a new white metal French-style mirror was the first of the five major changes to the bathroom. The pine mirror was once part of a natural-finish pine washstand, a classic American Country piece of furniture found in modest early American homes. 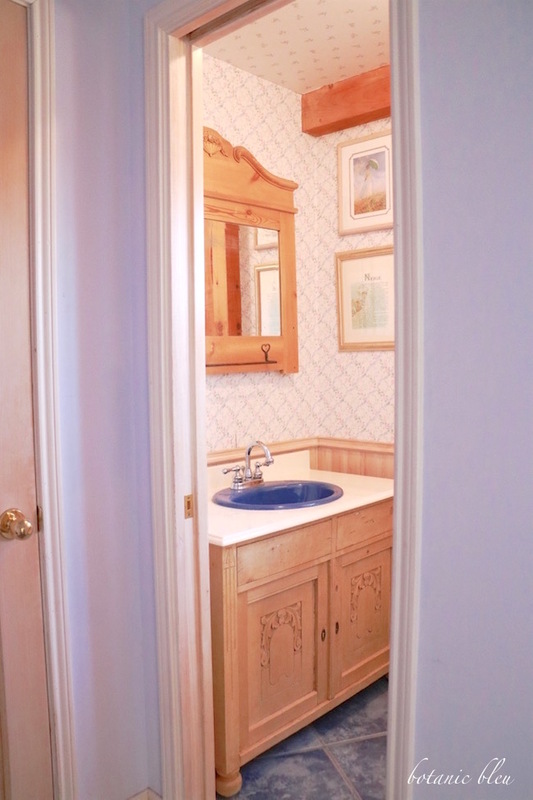 The carved pine vanity, blue sink, and faucets have not been changed. For new readers, here is what the bathroom looked like when I began updating it. See Half Bath from American to French for how the entire bathroom looked. The blue wall outside the bathroom is still the same color, but looks different in the photos due to a difference in lighting when the photos were taken. The first photo is closer to the actual wall color. All of the flooring in the laundry room, entry, half bath, mudroom, and kitchen was replaced with new porcelain tile with a rustic finish that mimics natural stone. The tiles were laid in an offset pattern similar to the way natural stone flooring was laid in vintage French houses. 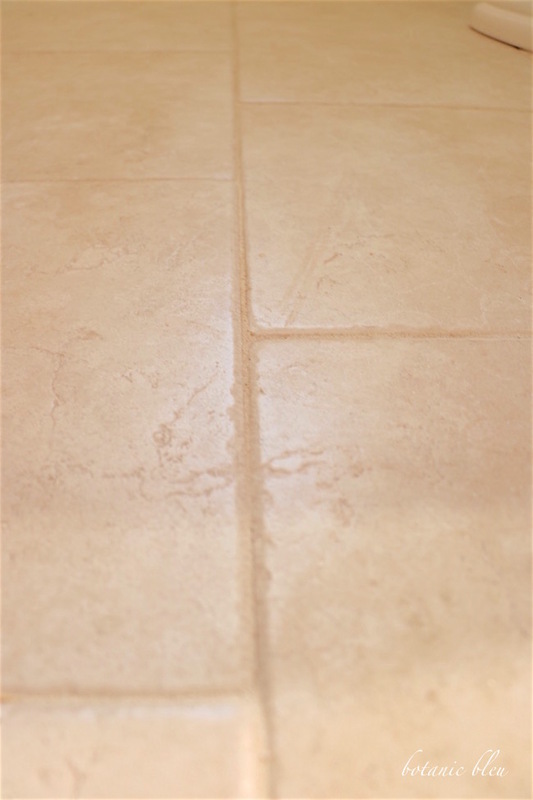 A waterproof grout blends with the tile colors and makes a narrow 1/16" grout line possible. The white and beige variegated tile colorations also resemble variations in real stone and help camouflage dirt. 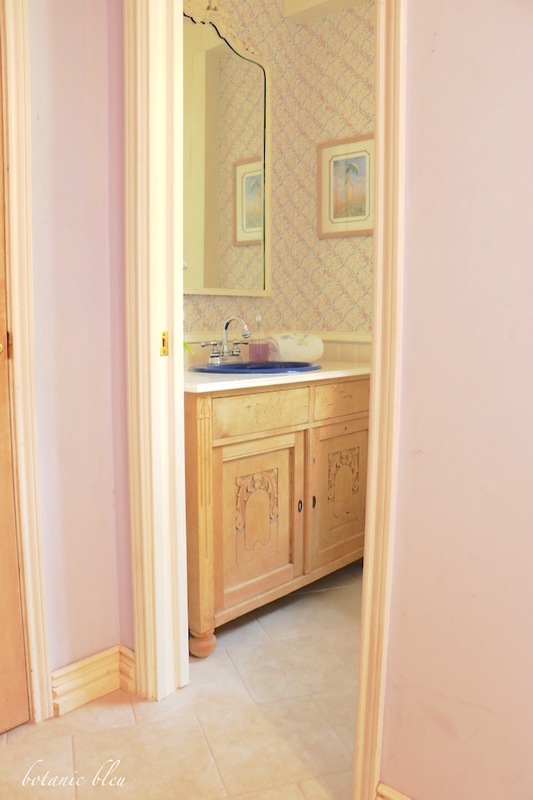 The light beige color coordinates with the natural pine vanity and the white-washed room doors. The light color brightens all of the house, and using the same tile in all of the rooms unifies the spaces that flow together. All of the woodwork was painted white, and the painted wood gives the bathroom a less rustic look than the natural pine posts and beams. The bathroom is very small, and the white wood is less of a contrast with the white background of the wallpaper than the natural pine. The shutters, the exterior door trim, and the hallway baseboards were already white. Painting all of the bathroom woodwork white blends all of the woodwork together. The snap-in wood grids that were in the windows gave an American Country design to the windows. 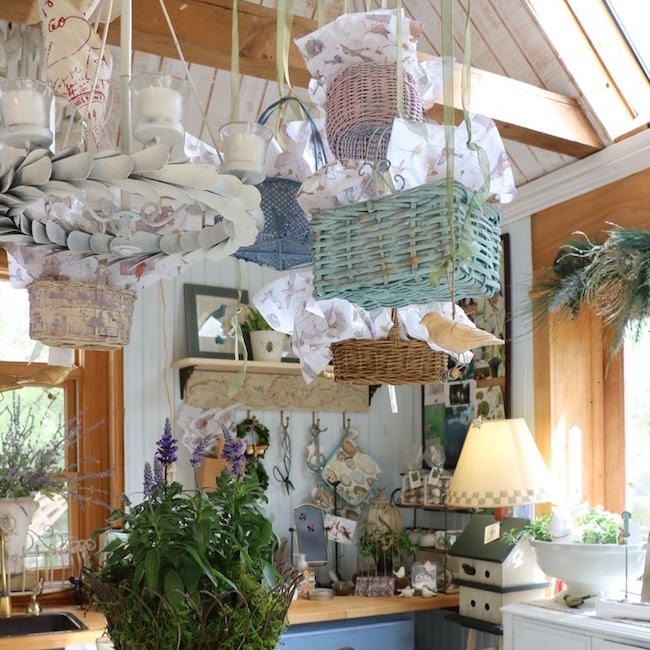 By removing them and the fabric valance, the window looks less American Country and more French Country. You can tell how small the bathroom is by looking at the blue wall outside the bathroom. 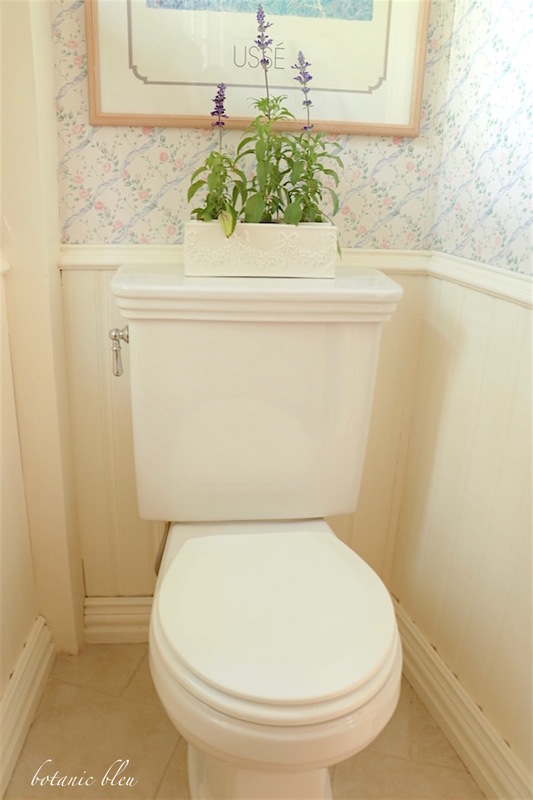 Now was the perfect time to replace the old ivory-colored toilet with a new white toilet with a 17" height seat. The new toilet was installed by the tile contractor at no extra charge since he would have had to re-install the old toilet. After searching local and internet sources, I finally found a round seat toilet that has a 17" height seat. Since the bathroom is very small, the elongated toilets and some of the round toilets were too long for the space. Plus, I found a beautiful replacement full of gorgeous curvy details. 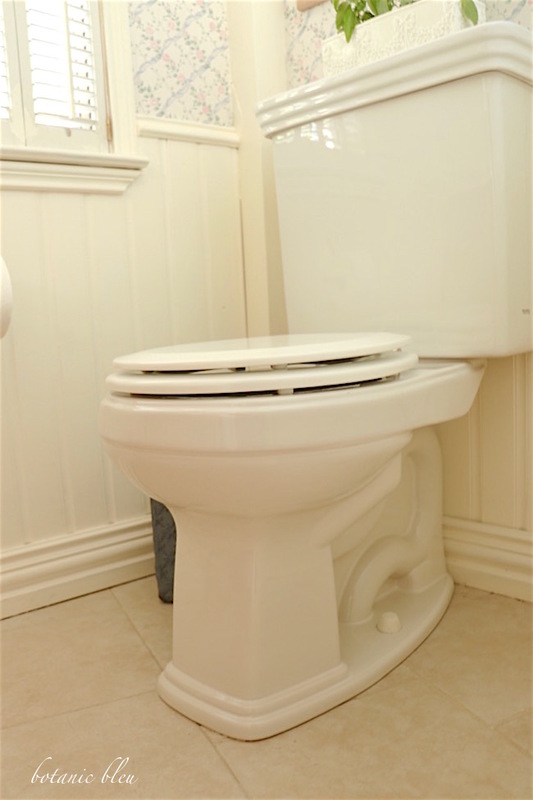 The curved ogee edge details at the floor, at the seat, and at the top of the tank look more French style than the old plain toilet. The old toilet had a wood seat cover that screams American Country. 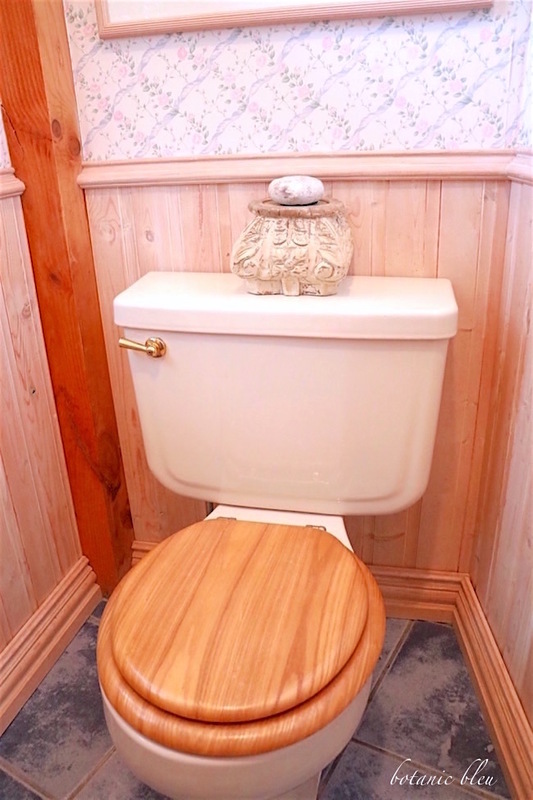 The toilet wood seat cover, the white-washed wood wainscoting, and the darkened pine post were too many different wood tones for the small bathroom. I love how the room looks now with all the wood the same white color. 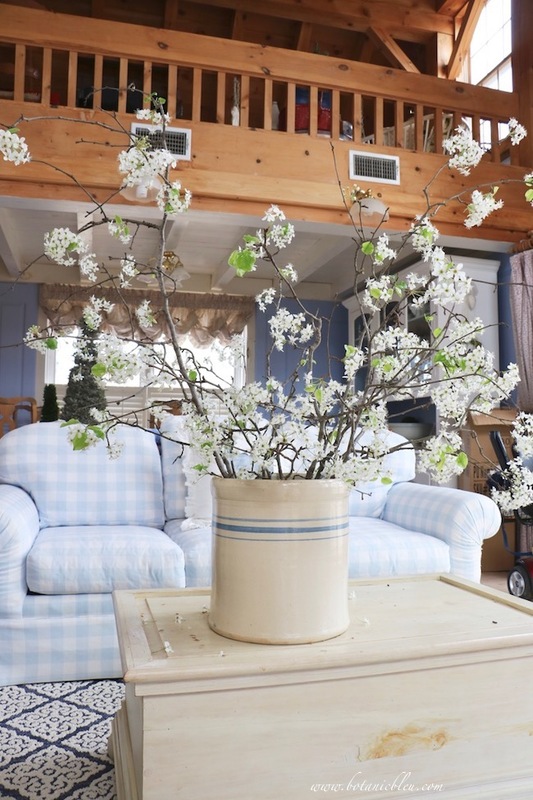 Blue beribboned trellis-design wallpaper has a romantic French look and was repaired in a handful of places. Loose edges were re-glued, a torn place was re-glued, and white paint filled a gap where two seams did not quite meet. Look closely, and you can see the repairs, but overall, the wallpaper is in good shape. Nothing can replace the iron toilet paper holder with its heart and whimsical squiggled-end. 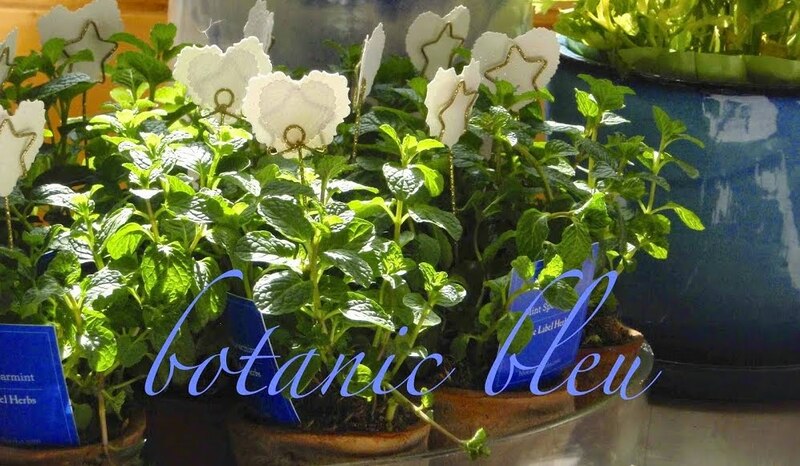 An old blue ceramic flower pot is now holding extra rolls of toilet paper. 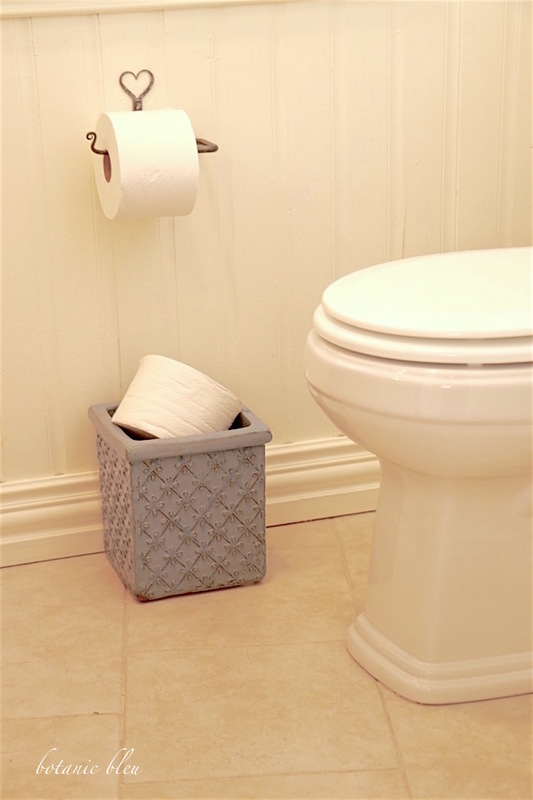 Take a look around your house for something unexpected to keep extra paper in your guest bathroom. The coordinating towel bar is slated to hang on the wall near the vanity.... when it is adjusted a little. The towel bar is a smidge too long for the space and needs to have its hearts bent inward just a little. Two French-themed prints were re-hung. Each is framed in white-washed pine wood that coordinates with the vanity. The mats have pretty decorative corners with a French vibe. 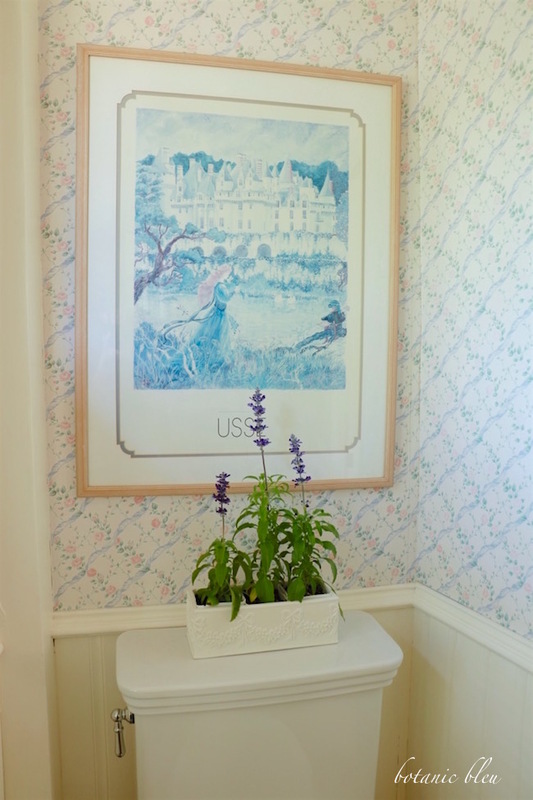 The large print over the toilet is of a French château, Ussé, and the small print near the sink is a reproduction of a Monet impressionism purchased in the Musée d'Orsay gift shop. The ceiling wallpaper with its spray of rosebuds also remains... maybe for another thirty years... Not only do I love the pattern, I love the history of hanging it. Makes me smile every time I look at it... NOW. Thirty years ago hanging it was stressful, but now when I look at it, I remember the love for the house, and the love shared, hanging it. 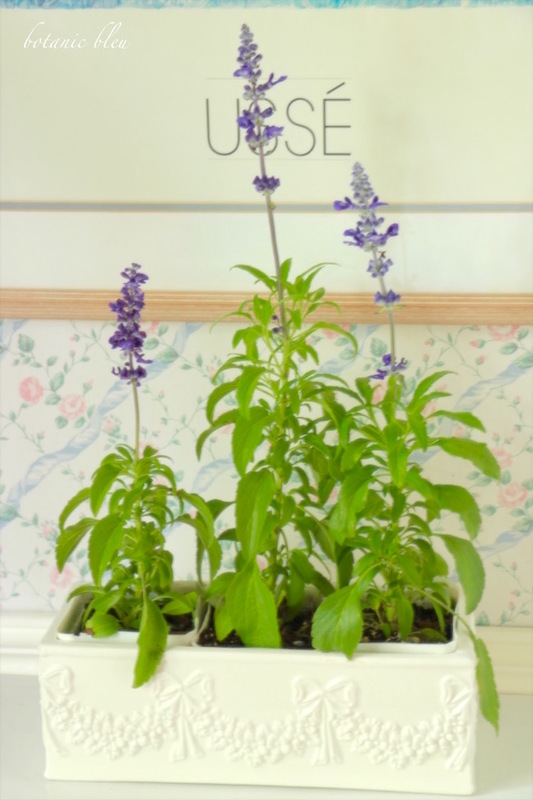 What lovely changes to your bathroom - even the toilet! It looks really good Judith! I love that you left many things and some just got a coat of paint! This is such a realistic remodel for post peoples budgets! 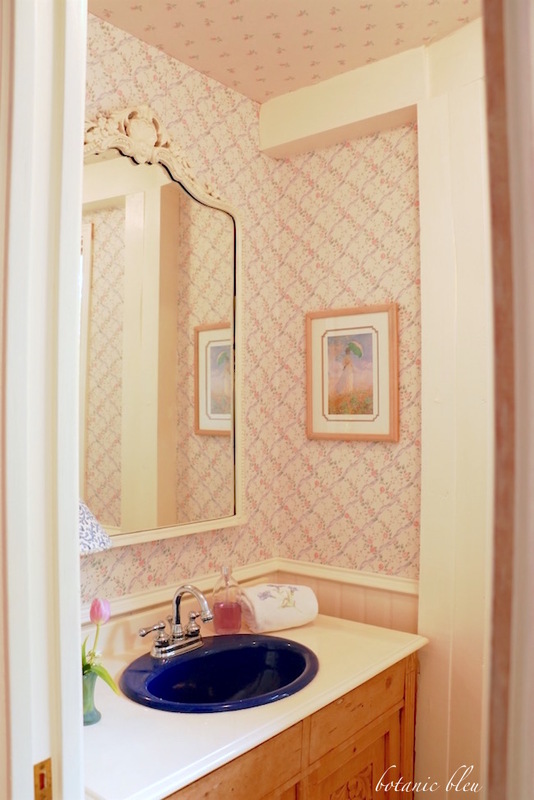 Judith, your bathroom is so beautifully updated. I like your thinking about the decor and the memories. 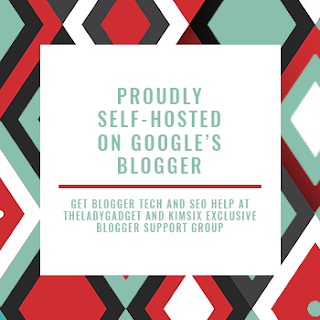 This looks fantastic!! Love the floor!! 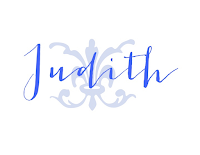 It really looks good,Judith. I think the flooring and white paint completely changed the whole look. Great inspiration for me! 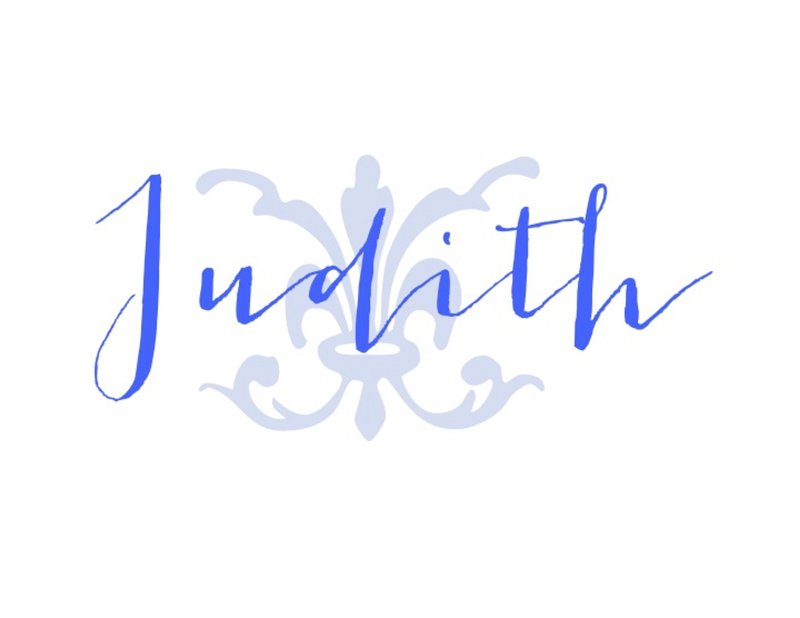 Judith, it is simply gorgeous, and you achieved your French design goals very well. I know the feeling of the smile that you have each time you enter....and I do believe I could name that toilet, lol, after researching so many of my own! Happy Friday. Love the changes! I'm still amazed at the power of paint to unify a space...love the woodwork painted all white. Huge difference! Ha! I have toilet envy. :-) Good choice to keep the wallpaper. 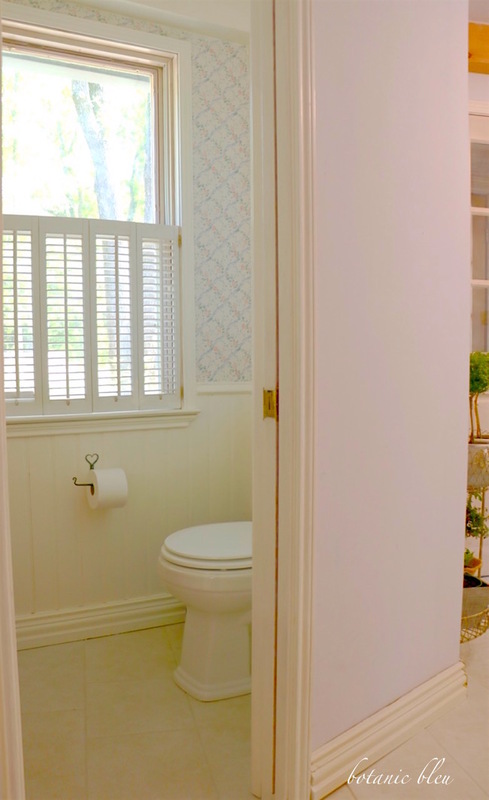 It's perfect in this room, as is the sweet little toilet-paper holder. It's beautiful! 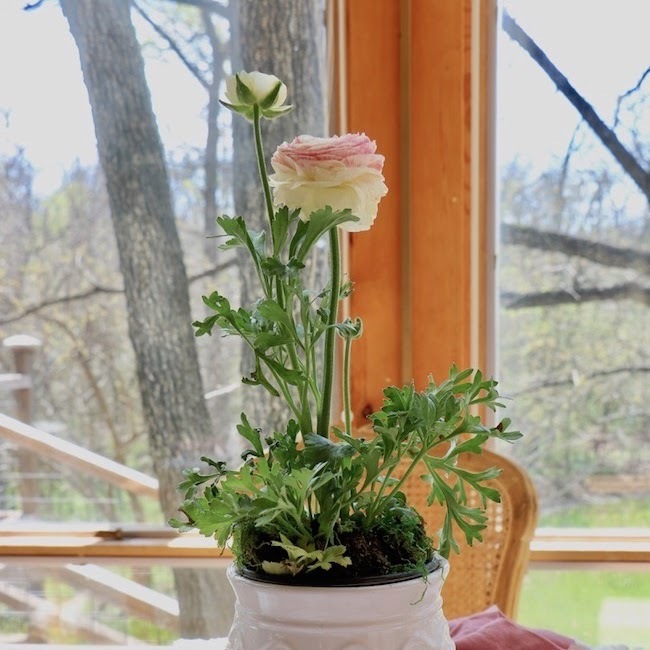 It's not overly feminine and looks very clean & fresh courtesy of the white paint. As mentioned above, fresh paint really makes a world of difference. Another thing I like is the fact that you didn't just gut the room but worked with existing elements and freshened up the space without spending $$$$$$$$$. The changes are perfect! What a great transformation. Your new floor is lovely. I will caution you to watch the toilet floor for any leaks. I have had bad experiences with letting a floor guy install the toilet. I had to have a plumber come and do it correctly when a little water started to leak months later. I love this. 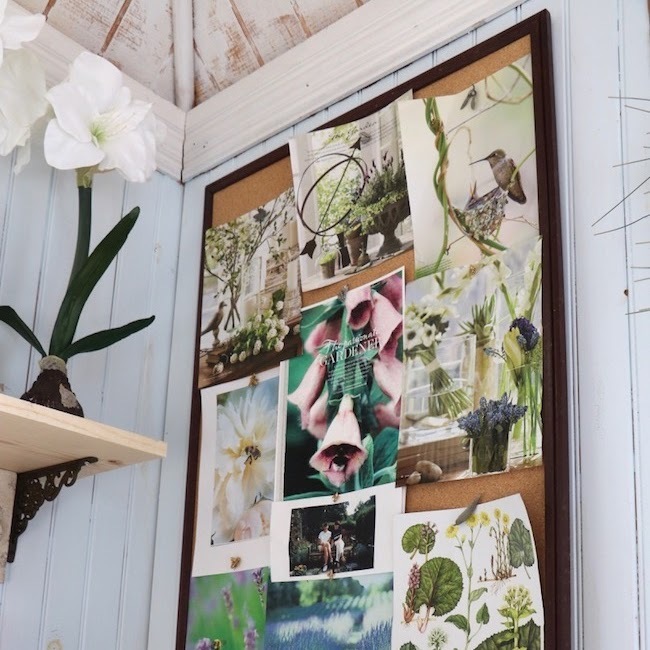 I adore the wallpaper too and the story behind it. Great update.